Thank you for visiting our website. 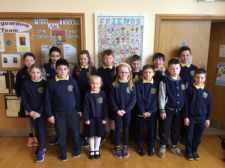 Here you will see and read about the many exciting things that take place in our school. 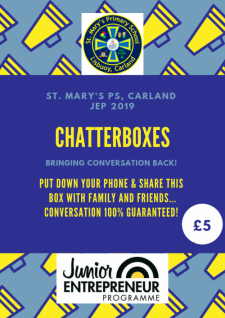 Junior Entrepreneur's 2019 present Chatterboxes! 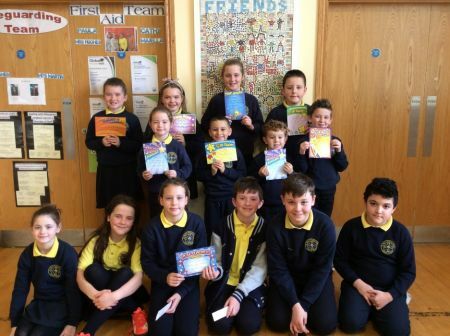 This product is an accumulation of months of hard work from the Primary 7 pupils who have been participating in the Junior Entrepreneur Programme. 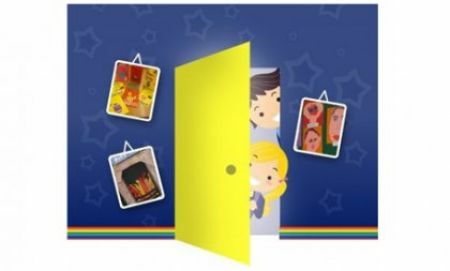 JEP is a real life entrepreneurship skills programme for primary school children. It nurtures independence, creativity and problem solving and engages pupils of all abilities, helping them to appreciate their own unique skills and to successfully create a real business through teamwork. The pupils decided on their final product after pitching their ideas to ‘The Dragons,’ in true Dragon’s Den style. Chatterboxes was seen as a clear winner, owing to its relevance and appeal to all ages. Chatterboxes would be a great addition to any family home or local restaurant or café, where people gather together socially. To find out more contact the school office, 02885567515. Every month we celebrate our pupils' success and achievements outside of school. What a talented bunch of children we have at St. Marys!